Obama's new site tries to fight ugly rumors by getting people to e-mail the truth to their friends. The strategy could backfire. Late last week Barack Obama's campaign launched Fight the Smears, a Web site that aims to put a lid on the chain e-mail-based rumors that have menaced the senator's presidential bid since its inception. By now you're probably familiar with the smears in question: Obama is secretly a Muslim, he refuses to pledge allegiance to the flag, he was sworn in to the U.S. Senate on a Quran, and his terrorist-fist-jabbbing wife has taken to calling people "whitey." As political rumors go, these are of a piece with John McCain's illegitimate black baby: Too ugly for polite company, the stories thrive on e-mail and talk-radio hearsay, and though they're trivial to debunk (the truth is just a Web search away), the lies seem possessed of uncanny sticking power. Polls show belief in the Obama-is-a-Muslim rumor now hovers at around 10 to 13 percent, up from single digits last December. In March, as part of a New York Times Magazine article on the science behind myth busting, I spoke to several rumor experts about Obama's efforts to fight the Muslim claim. In politics, conventional wisdom holds that the best way to neutralize a whisper campaign is to ignore it. The experts thought this was a bad plan, and they praised Obama's camp for aggressively pushing back at the Muslim rumor every time it's popped up in the news. Strangely, though, Fight the Smears represents a step backward from many of the campaign's previous get-out-the-truth efforts. The site presents fewer facts to back up its truths than did facthcheck.barackobama.com, the comprehensive truth-squad Web site that the campaign launched last November (that site brimmed with links to sources debunking the Muslim claim). What's worse, Fight the Smears violates a cardinal rule of rumor-debunking: When you're fighting a lie, don't repeat it. Senator Obama has never been a Muslim, was not raised as a Muslim, and is a committed Christian. According to Norbert Schwarz, a psychologist at the University of Michigan, this presentation style -- showing the lie first, then countering it with fact -- often causes people to later misremember the lie as true. Last year Schwarz and his colleagues Ian Skurnik and Carolyn Yoon showed people a similar "facts vs. myths" flier that the Centers for Disease Control had produced to set people straight on various false claims regarding the flu vaccine. The flier was formatted in the same way as Obama's anti-smear site: First it presented a myth about the flu vaccine -- for instance, that only older people should be vaccinated -- and then countered the myth with a set of facts (that young people with specific health conditions might need also need the vaccine). Just after reading the flier, people easily remembered which statements about the flu vaccine were true and which were false. But when tested 30 minutes later, "their judgments showed a systematic error pattern: They now misidentified 15 percent of the myths as true," the researchers found (PDF). Why did this happen? Over time, as our memories for details of a presentation fade, people rely on a rule of thumb to separate truth from fiction. If something sounds familiar to us, we conclude that it's true. By repeating myths about the flu vaccine, the CDC flier increased people's familiarity with the false claims, and thus confused them about truth and fiction. Obama's smear site invites the same confusion. There's another problem with Fight the Smears -- its conception that it can spread the truth "virally." The site asks you for your friends' e-mail addresses and even your e-mail password, with which it can access all your contacts1. Your friends will then receive a bland message from you -- typical line: "These assertions are completely false and designed to play into the worst kind of stereotypes" -- along with a link to Fight the Smears. Do you spot the obvious flaw in this strategy? Right: People who love Obama enough to visit his Web site -- enough to give him their e-mail password! -- are unlikely to have many friends who need setting straight. Polls show that belief in the Muslim rumor is confined to a few select demographic groups: Conservative Republicans, rural voters, and people without college degrees are most likely to think Obama is Muslim. Rumor researchers say that the best way to fight a myth is to take your refutation to the social groups who believe it; this way, you minimize the possibility of introducing the lie to people who hadn't heard it in the first place. Fight the Smears turns that design on its head. It pushes the story to people who know the truth in the hopes that they have at least a few misguided friends who need to be saved2. Sure, every Obama follower probably has an in-law or wacky uncle who believes the Muslim rumor. But given the pattern in which the story has circulated, Obama's supporters are likely to know many more people who've never suspected that Obama has been lying about his faith. Fight the Smears risks infecting these groups with the rumor, and, due to its poor layout, it might even push some of them to believe it. 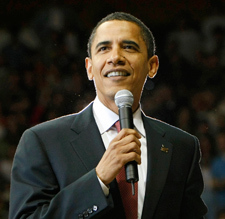 If Fight the Smears doesn't work, how should Obama fight rumors about his faith and patriotism? According to researchers, he should keep doing what he's been doing: When he's speaking to people who may have heard the rumor, he's got to offer a clear, substantive refutation, detailing the facts of his life that belie the false claims. On the stump and in interviews, Obama has done this masterfully, says Nicholas DiFonzo, a psychologist at the Rochester Institute of Technology who studies rumors. It's a low-tech approach, to be sure, but it's got emotional appeal. Hearing the truth from the candidate himself is the best way to push people away from the lie. 2 Some techies have wondered whether the campaign's real goal with Fight the Smears is to game Google. Wired's Thomas Goetz notes that by putting out a fact sheet that bloggers are sure to link to, the campaign might be trying to "drive fightthesmears.com toward the top of a Google search on, say, 'obama muslim' or 'michelle obama whitey.'" That could be the campaign's goal, but it's hard to see how the strategy will slow down chain e-mails. Google already abounds with links to fact-checking sites that definitively debunk the Obama myths. The first result for "obama muslim," for instance, goes to the thorough Snopes.com page, which, in theory, should be much more powerful against the rumor than an Obama page (Snopes, after all, is independent of the campaign). People don't believe that Obama is a Muslim because Google has given them bad info -- they believe it because they dismiss the good info on Google, or, more likely, because they trust what they've heard through e-mail and have never bothered to do a Web search. Back to top.